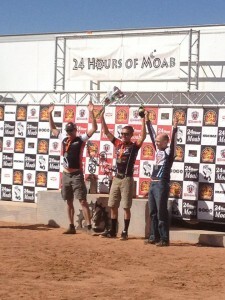 The 24hrs of Moab was on my mind since early spring soon after 24hrs in the Old Pueblo. I knew 2012 was the last year for the race and I wanted to do it before it was gone. After my original support crew (my wife and kids) backed out because of other commitments I was planning to go self supported, which I wasn’t looking forward to, but I figured I would just get through it. Once my friends Jon Davis and Tim Lutz decided to pit for me, I knew I had a chance at the podium if I could just keep it steady and stay within my limits. I had done this course as a 4 person team twice before, so knew what to expect from it. Except this year, someone dumped a beach on the course. The sand was deep, and would stop you in seconds even doing 30mph down hill. The race started off pretty good, I came in 3rd place on the first lap, I think top 15 overall. I was a little surprised when I heard that from the announcer as I passed through. I felt good and just keep riding a comfortable pace. 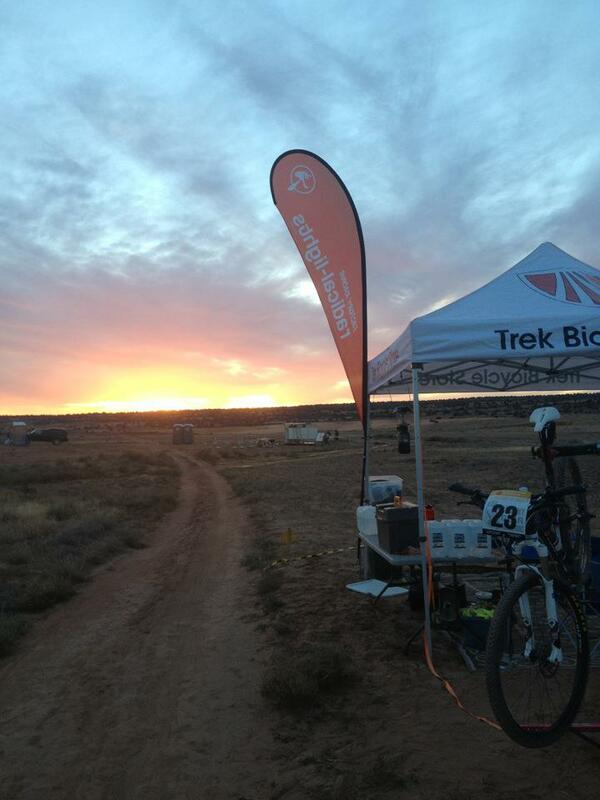 Once the sun set, my lap times slowed, but my times were consistent. I held 3rd place until late in the night when last years winner Andy Jacques-Maynes crashed and sat out for a few hours. Now in second place with 50-60 min on third I was just riding my pace and still putting in time on 2nd. Josh Tostado had lapped me twice by 2am so there was no chance to catch him. At 8am he had done 14 laps and was taking a break. In the early morning, maybe 6am, Jon told me a guy that was in 12th place moved up to 3rd and was coming on strong 45min behind. Richard Abbot was putting 15 mins on me each lap. I tried to go faster, but my body and mind was struggling to get through each lap. I was trying to be smooth and consistent and trying not to loose too much time. Jon told me that I may have to go out for another lap if Richard came in before 10:30am. 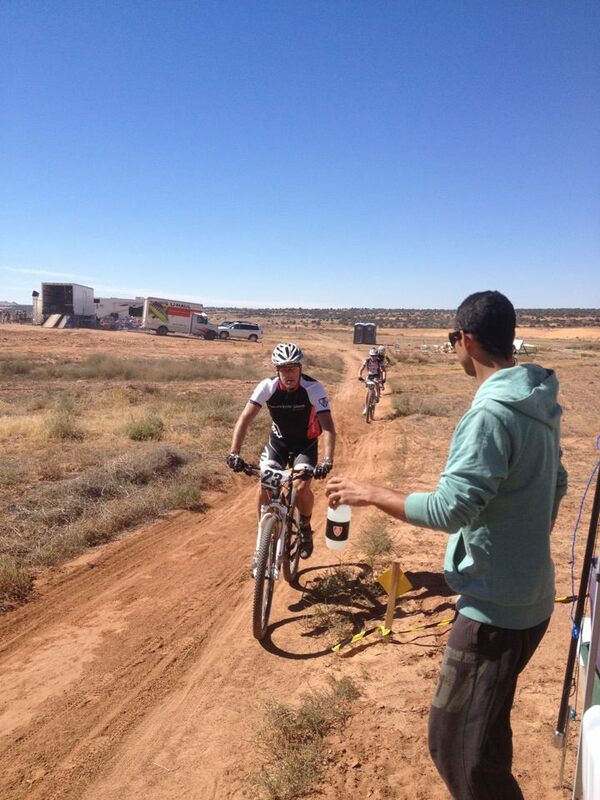 Lap #14 was my biggest challenge of the race. I was so sore and tired. Each pedal stroke there was pain in my feet. my hands struggled to hold on to the bars. I didn’t know how I could possibly do another lap. I finished lap #14 at 12:02, unable to make 15 laps. Richard finished lap #13 at 10:45, so he would have to pull a 1:15 lap to catch me. I had secured 2nd place, but by only 9 min. Richards last lap was 1:29, close to his lap #3. If Richard had started his attack 1 lap sooner, no doubt he would have caught me. I was very happy to get 2nd place. I could not have done it without the help from Jon and Tim. Not only did they have everything ready for me each lap, but they gave the mental strength to keep going. Jon was posting about the race on Facebook and he told me about the cheering and good wishes from my friends, which also gave me strength. Though, most of my strength came from thinking about my wife and kids at home cheering for me. I could hear them telling me to keep going and not to give up, keep pushing, you can do it. In the end, I was glad I did the race, but I’m also glad I was the last time it will be held. I didn’t really enjoy the course and I don’t want to convince myself to do it again. It was absolutely hands down the hardest event I have ever done. It was a great way to end the season, and I’m looking forward to starting the 2013 season with the 24hrs in the Old Pueblo Mens solo. Posted in Race Reports, Training Blog.